Figured id share it here too. 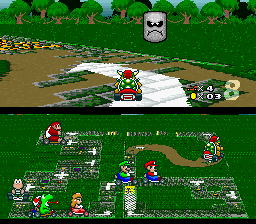 This is a hack of Super Mario Kart I have been working on the past month after picking up my past dead SMK hack of 2010. 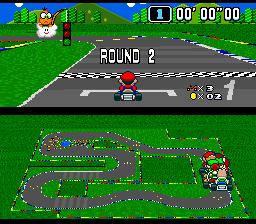 -Brand new themes: all themes (minus rainbow road) will be replaced. -24 new tracks: All tracks will be changed, including the 4 battle tracks. -New graphics: to suit with the new themes. 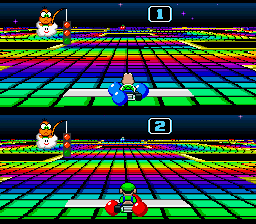 BGs, some road tiles and palettes will be changed to accommodate the new themes. 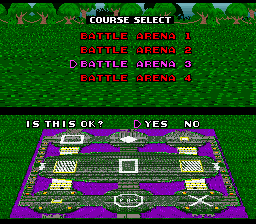 Im also planning to edit the menu, podium, title screen,icon etc. graphics. -All new themes have been decided. 3 new themes are complete. 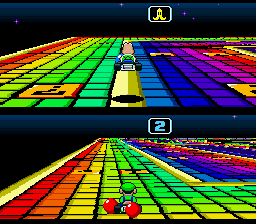 5 themes have already their main road palette and extra road tiles changed; just missing the new BG. I will try to keep you updated with new videos and screens. Nice. 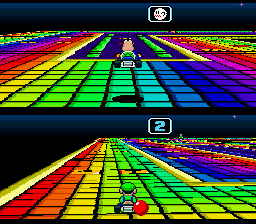 I like the Rainbow Road arena. 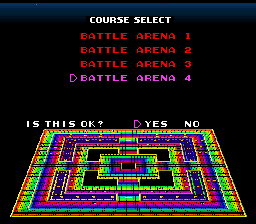 Yeah, I always thought the idea of a Rainbow Road arena would be cool. Here's a new track and theme I uploaded today. Figured it's bettet to show all the tracks than not releasing anything at all soon. But why only one item box? Two would suit the length of the track a bit better in my opinion. 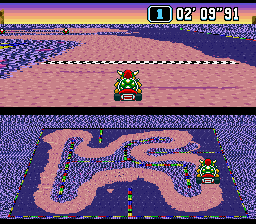 And I actually tried to make that a standard in all the tracks, but I can't due to the limitations of the game. Making 2 item areas means more items will be generated. 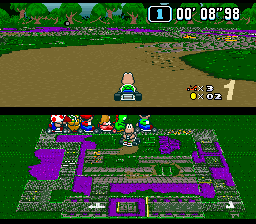 This can cause that on the third or second lap (depending on the items the CPU throws), they are many items on the stage, and they start disappearing when you use another ( in 2 player races, this is a huge issue since it happens earlier), so I decided to stick, for the most part, the 1 item area on the track, like the original Nintendo tracks do. 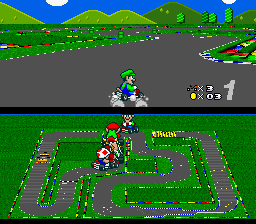 Some other tracks I made still have that 1 or extra item box later on the track. Esp I like the background. Regarding items: Can't you simply put less items in the first item area and instead put some later in the track? The only problem I see with that is that players who are in front have a higher chance to get items, but I'd prefer that over having one item only per round. Hmmm, well its the same problem due to being many items. 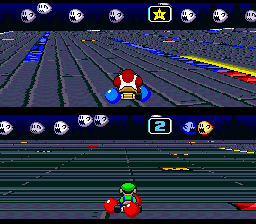 Though even I have to agree that 1 item per lap is frustrating. I'll see what I can do to existing tracks to add more item boxes in other places. 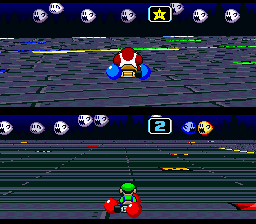 maybe I can add 4 more item boxes so in 2 player modes there are at least 2 laps where you can get multiple items, since the standard area where item boxes are, they should have 10 at least. It was never cancelled haha. I guess it was abandoned. I think my problem is that I need to finish the remaining backgrounds, since the tracks left are from incomplete backgrounds/themes which I haven't decided yet, so I'll be working into that. Ok, so it's been far, far too long since I started this, but this time I'm determined to finish it. To give you guys context, I actually lost inspiration because I had like 4 tracks left to do and 2 themes to finish properly: the ghost valley and choco island one. So for an update, I got inspiration to finally finish and settle for the choco island replacement theme. 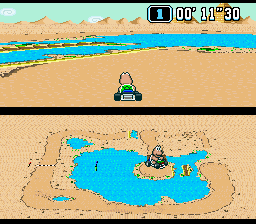 I'm finishing on the BG, and then I will add more road GFX and change the repeating tile to be a cloud graphics, as well as re tile the track with the new tiles and decoration. that looks good for SMK. the the outer/center grass is quite constrasted and hard to look at, but I like the color picks. 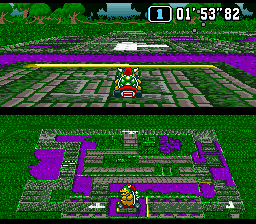 It is a remake of my old bowser castle 3, and to keep with trying to make the repeating themes tracks look different,this is the one that looks the more decayed/broken. I don't see a download, and that makes sense given it's no finished. may I request a quick build to try this out? It seems to be almost done, so I don't think you'll have wait long either way. This. Looks. AMAZING. I have to get this when it's done!!! Also, You could join my hacking discord for SMK! Not really. 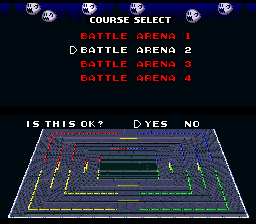 I say the hack is about 60% complete in terms of effort; I want to edit the title screen, credits text, character and cup selection (and maybe even music). 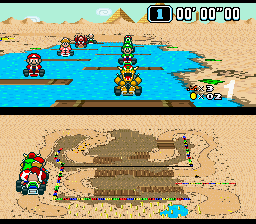 For tracks tho, only 2 are really missing; the second choco island track and the third ghost valley. The other missing tracks will be a redo/repolish of my old existing tracks. For backgrounds, I'm currently finishing the new choco island one, and the ghost valley one is partially done too; I have the design in mind, just need to draw the GFX. I, myself have dabbled in SMK hacking and it's just MS Paint. Also, I want to beta test as well! Wow, haven't seen many SMK hacks, the custom themes look nice, good job. 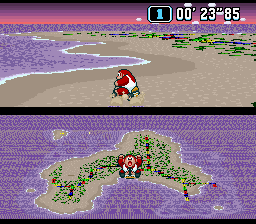 Although, are there any custom behaviors when it comes to track terrain? Would be interesting to mix some tracks up a little. I mean, I've really only made CTs and have tried decompressing the codec. I don't really know how to edit tile behaviors and making your own. If you want to try SMK hacking for yourself, here's a good tool. Btw, SMBNext Halloween special looks frighteningly awesome! I don't want to go through the hassle of getting CFW on a 3DS though. 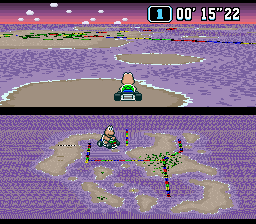 EDIT: Here's something I call: the Super Mario Kart Hacking Domain!